It’s been a while, folks! Have been busy mostly with the development of rootwork.co, and zitrr.com websites, and overhauling my own Homepage! A lot of things have come to a hold to get my Startup running, but my crazy desktop mods will not! Today’s shot shows mostly stock Enigma with a helping of mods to get exactly what I want. 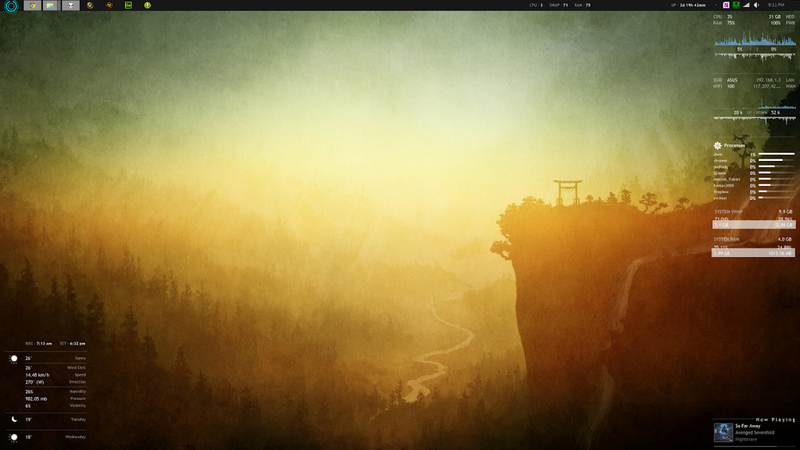 If you view the full-res shot, you’ll notice the CPU/RAM/Swap/Up-Time info overlaying the Taskbar. They’re way more useful than I thought they’d be when I put them up there… I find that with the Chrome+Photoshop/Illustrator+Dreamweaver combo up, 4GB of RAM is really lacking (no surprises there!) The Mac has a decent processor, but I really need to save up and get myself some Vengeance! Beautiful Wallpaper, don’t you think? This entry was posted in Mods and tagged computer, customization, desktop, laptop, mod, rainmeter, wallpaper, windows. Bookmark the permalink. Follow any comments here with the RSS feed for this post. Post a comment or leave a trackback: Trackback URL.